We would be pleased if you would decide to spend your holiday with us. 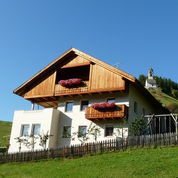 Our house is family run and located in a sunny position with a unique view on the Dolomite mountains Sas dla Crusc and Pütia. The Dolomites are part of Unesco World Natural Heritage.